It so happened that on the morning of January 13th, I rode in my car and heard Rebecca Solnit on the NPR program entitled On the Media. She read an excerpt from her 2004 book called Hope In the Dark. Her reading, as well as her subsequent interview, convinced me that I had to experience the work for myself. She begins with a quote from Virginia Woolf during WWI that says, “The future is dark, which is on the whole, the best thing the future can be, I think.” Solnit goes on to clarify that, in this case, darkness does not equate disaster, it merely reminds us that the future is ultimately unknown. These are troubling times, and it is by no accident that this book, which is well over ten years old, is experiencing a resurgence. Hope In the Dark illustrates some horrific calamities of the late 20th Century, but it also goes on to discuss how those disasters served as a catalyst to change, real change—positive change. It also spends a great deal of time illustrating that the most potent of such change came through the efforts of people, regular citizens, standing up, taking action, and making their voices heard. And even though some of these events may seem dated, if you read carefully enough, you’ll realize that the specific things she’s focusing upon absolutely have an effect on today’s local and global political climate, and, well, meteorological climate for that matter! It is with great satisfaction that I read this book even as the Women’s March in Washington and throughout the world ensued. It proved that what she said then is undeniably applicable today. Our peaceful action speaks volumes; our voices can and will be heard. Many of us feel hopeless today, but this book will instill faith in your fellow citizen … and yourself. It will inspire you to do something, no matter how small, and to make your voice resonate. It will, in the end, help you to realize that the future is dark, but, as Solnit points out, many things grow in the dark, things that later offer both beauty and sustenance. We have the power to make our own story; we have the means to create our own future. 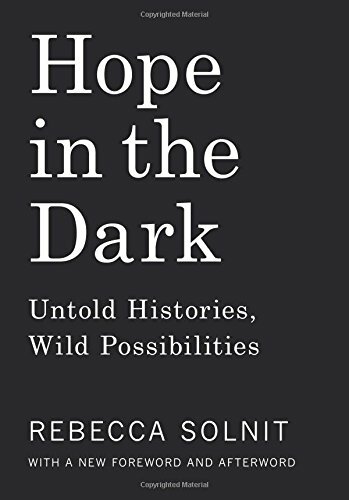 This entry was posted in Book Reviews and tagged activism, books, hope in the dark, literature, nonfiction, politics, rebecca solnit, reviews.